The Ibanez RG is probably one of the most recognisable and iconic guitar shapes in the long history of the guitar. Its sharp points and beautiful curves give it elegance with a touch of venom. Through its many iterations, the RG has been the workhorse model of choice for guitar players around the world, from jazz to metal. In the metal world it has secured its standpoint by morphing its uncompromising playability to suit the needs of six string players, seven stringers and 8 string djentelmen alike. The range of options is vast on this particular model, with hardtail versions for players who want absolute stability, and vibrato models for those that want to drop bombs and scream the place down. The Iron Label series has been a welcome refreshment to the ideas of building the shred machine. The series combines all the features and playability of the existing models, the variety of fixed bridge or double locking vibrato units, string count and gorgeous looks with that one thing we all find hard to swallow when we look for our guitars; affordability. Ibanez threw it all on the line and created an affordable, reliable, uncompromising weapon of maximum shred, and have been reaping the rewards. This particular model, the RGIR27E, is one of two 7 string examples on show within the body shape. Its main feature is the double locking EDGE-ZERO II Floating vibrato unit. The other version of this is a fixed bridge affair, denoted by the F in the model number (RGIR27FE). Both feature EMG 707 pickups for the ultimate sound of brutality, a 25.5 inch scale neck to handle not only the standard six strings with outstanding stability, but cater for the low B string with ease. It aptly manages to retain the string tension, whilst allowing great articulation of the low notes. If you find that low B isn’t brutal enough for you, slap some heavier strings on and tune down to A or G and unleash a fire breathing monster of death and destruction, and it will even hold a low F with a good amount of accuracy, (and a damn good set up job). The EDGE-ZERO II is a development of the original Ibanez Edge series of double locking vibrato units, and it certainly lives up to the reputation built by it’s forbearers. Because of the unit being double locking (strings lock at the bridge and at the nut of the neck) the system allows extreme changes in pitch, both up and down and tuning stability is rock solid. As the strings terminate at the locking saddle on the bridge, the transfer of vibrations through the bridge to the body is a direct transfer. This allows the guitar to sustain notes whilst being manipulated by the vibrato, and harmonics can be held for extended periods of time. The fine tuners on the bridge allow for precise tuning when the strings are locked down, and allow quick tuning changes if a string slips out of tune. As if that wasn’t enough, the bridge is a recessed floating affair, so the strings can be pulled sharp and allows for all sorts of musical devilry. The neck on the RGIR27E is fast, flat and wide for all kinds of shred play. The unfinished Maple feels extremely comfortable and rigid, combined with the Bubinga stripe running through the centre to enhance the rigidity and tone of the neck. The older Ibanez necks were a combination of Maple and featured a couple of Walnut stripes and were a multi-ply neck configuration, that were superbly sturdy, and featured some of the thinnest neck profiles imaginable. This particular neck feels ever so slightly thicker, but still feels amazing to play, both from a lead standpoint and a rhythm perspective. With a 400mm radius, the neck is fairly flat, and that allows for lower string heights, so the super low action is a breeze to play with. Some people find these necks hard to adjust to, because they have had to compromise with other necks, which are rounder, fatter and harder to contend with. Ibanez have given the best of both worlds and taken the neck into another dimension. A Rosewood fret board warms up the sharp attack of the Maple, whilst keeping the clarity of the notes. The absence of fret markers can be off putting at first, but take comfort in the fact that the side markers are visible even under stage lighting, so you shouldn’t get totally lost whilst wandering around slaughtering innocent victims with your brutal shredding. The audio department is covered with the addition of one of the best, if not the best, active 7 string pickups on the market today, the EMG 707. The 707 has been the pickup that companies have tried to emulate for many years now, and some consider it to be the only 7 string pickup worth talking about. EMG asked their line up of 7 stringers what they were looking for in a pickup and almost all of them reported back saying “We want the 81 in a seven string format”. And thus it came to pass that the 707 was an 81 with a bit more, and gave rise to the demonic soapbar pickup that adorns the guitars of some of the best guitarists who utilise the un-natural 7 string guitar with great destructive power: players such as Jeff Loomis, Rusty Cooley, Dino Cazares, Christian Olde Wolbers and many more besides. Because of the ceramic magnets inside the 707, the notes are crystal clear, and have a remarkable bark and bite under crushing amounts of gain. The 9 volt battery that powers these pickups allows for true power, (there is even an 18 volt mod to soak the power and give even more output from the guitar). When choosing a body wood, most people overlook Basswood as a cheap, undesirable wood. But as many more companies offer Basswood as a body wood choice nowadays, it is becoming a very popular choice among Pros and bedroom shredders alike. Lighter than mahogany, but just as full sounding, but with more emphasis on the lower end with a well defined mid range, Basswood is an excellent compliment to a maple neck. Add in the EMGs and an EDGE-ZERO II Bridge, and you are ready to decimate your audience with the first note. Finally, we get to the all important bit of price. For most signed artists, endorsements will either pay for, or discount their instruments. For us mere mortals who can’t even get money off our shopping, this is a dream, one that is very rarely achieved. We scrimp and save just to afford a set of strings most times and purchasing a new guitar only happens when a store has a sale, or someone we know has had enough of their axe and wants their newest toy (or needs to buy toys for the new arrival in the form of a screaming, puking firstborn). Quite easily the best thing about the Iron Label series is the price range. The standard fixed bridge 7 string is offered, without it being a sale or having a big discount, for the miniscule price of £515.00 at Andertons music store in Guilford (online prices/store prices may vary). The EDGE-ZERO II version is priced at the tiny price of £599.00 at Andertons (again prices may vary) which is an amazing price for such quality craftsmanship and for a guitar that will rip audiences in two. And so to recap, the Ibanez Iron Label RG, in either version, is a great addition to your arsenal, whether it’s your first 7 string or just another weapon to use. The Ibanez Iron Label series has you covered. Jeff Loomis, Monuments, Vildhjarta and Stealing Axion come together this October for the first ever Euroblast tour, presented by the organizers of Europe’s biggest progressive metal festival. Since its inception in 2008, Euroblast Festival in Cologne, Germany, has grown exponentially to become the most important event in the progressive and technical metal calendar, and the EB team have called upon the very best the scene to showcase progressive metal across the rest of Europe. The festival has always boasted an international lineup and this tour is no different, bringing together bands from the USA, UK and Sweden, for what is set to be the mind melting tour of the autumn. Northwest America’s Stealing Axion open the show with their melodic and expansive sound, followed by the djenty poundings of Sweden’s Vildhjarta and UK’s technical power goove masters Monuments rotating direct support. 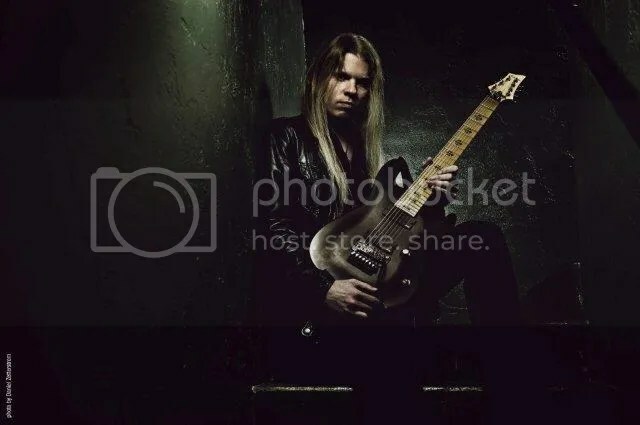 The night will be closed by one of the most technically accomplished players in modern metal, Jeff Loomis, whose ability to push so many different boundaries of what’s humanly possible on six strings, makes him the perfect headliner. Plains of Oblivion (Jeff Loomis), Gnosis (Monuments), Måsstaden (Vildhjarta) and Moments (Stealing Axion) are all out now via Century Media and Inside Out Music.